In a visit to Cass Business School, Lord Bird MBE talks about the next generation of social entrepreneurs and why we all need to be business people. A self-described artist before a businessman, Lord Bird MBE, founder of The Big Issue and member of the House of Lords, identifies an emerging social entrepreneur that is heading into the fourth industrial revolution. “Social enterprises in a sense are historical bridges between charities, which are rarely self-sustainable and businesses which aim to make a profit. I think in the next 5-10 years, we will completely move away from having charitable vs profit led capitalists, and we will see businesses people who occupy both. 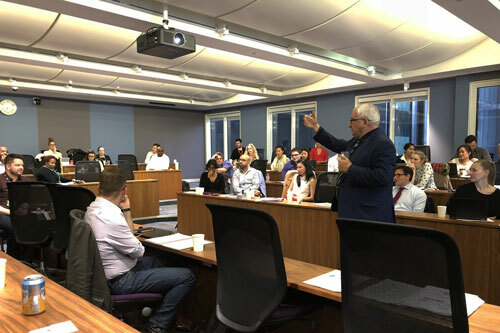 Lord Bird was speaking at a Cass event titled 'Purpose driven strategy: Building social business models', where students were set a task and had a live discussion finding solutions to the problems that almost forced The Big Issue under after its launch in 1992. 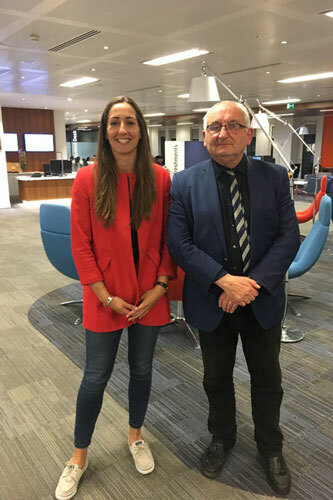 The case was introduced by John Gilligan - Non Executive Director at Big Issue Invest and organised by Alessandro Giudici, Senior Lecturer in Strategy, with help from Aurore Hochard, Head of Entrepreneurship. As part of his visit, Lord Bird identified that emerging student entrepreneurs are more focussed on making a difference rather than just making money. “We have to stop the situation where charities collapse as they try to become social businesses rather than charities. Businesses need to support these charities and that can be done with social entrepreneurs. These are the people who tell the charities, the schools and the hospitals to get on with their important work while they crunch the numbers and make sure there is enough money, enough time and enough resources. This creates an opportunity to offer a hand up rather than a hand out. “I am nine months into my time at Cass and I have really enjoyed the events, classes and opportunities to meet new people. I was born and raised in Boston, but have lived in London for 22 years, so I have had quite a lot of time to learn the city. “I think the majority of companies are moving into a space where they see their corporate sociability as part of their business strategy. Organisations like Big Issue Invest have the funding to support people who can connect the dots between the money and social enterprise, as that is what will allow them to scale. London is a fantastic place and there are a lot of intermediates or consultants who sit between the funding and the businesses. There are entrepreneurial communications and legal people working with environmental businesses to help make the eco system collaborative rather than competitive. Supporting these intermediary people is pivotal to ensuring social enterprises continue. Lord Bird highlighted the fact that school children and the general public need to be more business minded, if they are to succeed in the future. “In the world that we are moving into, the fourth industrial revolution, everybody will have to have some knowledge of business and entrepreneurship. 63% of the job market for a ten year old child leaving school in 11 years has not been created yet. “It is so important for business experts to get behind business schools and help develop the next generation of entrepreneurs who have realised that it is beneficial to use their knowledge and skills to help their communities. In summation of his visit, Lord Bird concluded with: “I come to universities looking to help young people – whether that be talking to them about my experiences or introducing them to someone I know. I want to hear good ideas and see people who are looking to make a difference. Lord Bird founded The Big Issue using money donated from Gordon Roddick, founder of The Body Shop in 1991. Only three months into its launch, The Big Issue almost went under losing almost £30,000 a month, despite selling three times the amount of magazines then planned. At the event, Lord Bird revealed that he turned the companies’ fortunes around by doubling content and rewriting a strategy that was not so reliant on advertising. The Big Issue today sells approximately 82,000 copies per week and has 2,000 vendors across the UK. Vendors are also assisted with opening a bank account, saving money and given pathways to healthcare and help with addictions.